Prepare! is a lively 7-level general English course with comprehensive Cambridge English for Schools exam preparation integrated throughout. This Test Generator is a CD-ROM with a comprehensive range of tests to suit different evaluation needs. 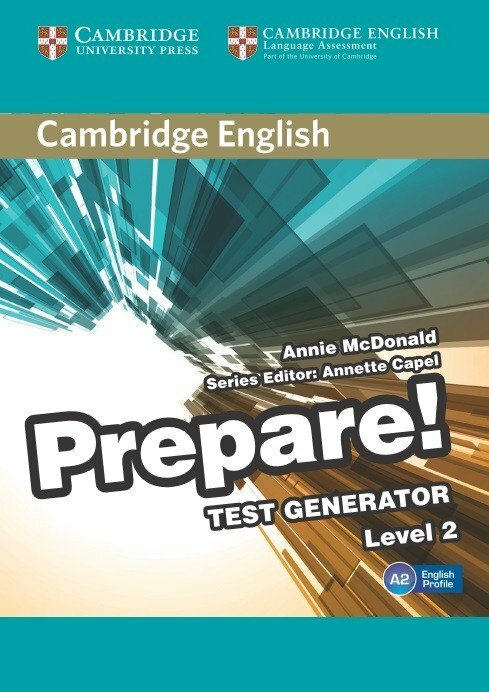 Unit, term and final tests offer revision of vocabulary and grammar from the Student's Book and extra skills practice. Available at two levels of difficulty, 'Standard' and 'Plus'. Teachers can also create their own tests tailored to the needs of their students at the click of a button. Options include choice of unit(s), number and choice of questions and level of difficulty. It also includes ready-made progress tests after every two units and achievement tests to assess overall progress after every four units.